Jill M. Mhyre, M.D. (center) at the investiture ceremony along with (from left) Chancellor Dan Rahn, M.D., Dola S. Thompson, M.D., Jeannette M. Shorey II, M.D., and W. Brooks Gentry, M.D. 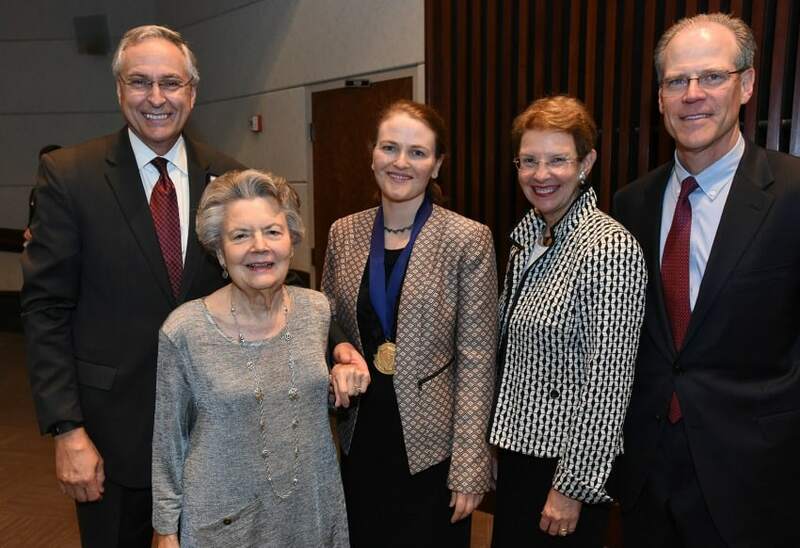 Nov. 7, 2016 | Nov. 7, 2016 | Jill M. Mhyre, M.D., an authority on obstetric anesthesiology at the University of Arkansas for Medical Sciences (UAMS), was invested Nov. 1 as the inaugural recipient of the Dola S. Thompson, M.D., Professorship in Anesthesiology. Mhyre is the vice chair for research and associate professor in the Department of Anesthesiology in the UAMS College of Medicine and directs the Division of Obstetric Anesthesia. An endowed professorship is the among the highest academic honors a university can bestow on a faculty member and is established with gifts of $500,000, which are invested and the proceeds used to support the educational, research and clinical activities of the chair holder. Those named to a professorship are among the most highly regarded scientists, physicians and professors in their fields of expertise. 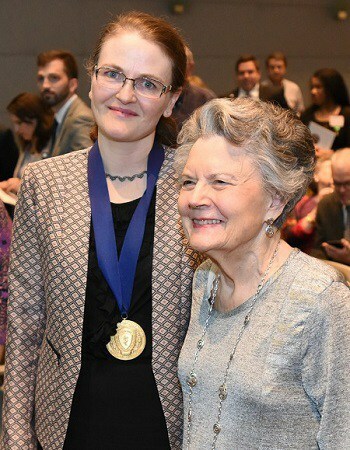 The initial funds for the professorship were donated by friends and colleagues in honor of Dola S. Thompson, M.D., who served UAMS and the College of Medicine for decades as a professor and department chair, and who is recognized for her scholarship, academic leadership and excellence in anesthesia care. Thompson also made a significant gift to the professorship. “Dr. Thompson has been a relentless advocate for patients, for learners at every stage of medical training, and for faculty throughout her whole career,” said Jeannette M. Shorey II, M.D., associate dean for faculty affairs in the College of Medicine and associate provost for faculty. “She is one of the role models in my life. It was normal for Dola Thompson that women should be physicians and physician leaders. She was a pioneer here who demonstrated with success and grace that a smart, qualified, curious woman could be a great leader. Thompson, a 1949 College of Medicine graduate, began her career in anesthesiology in the 1950s when few physicians entered the specialty and anesthesia departments were few and far between at medical schools around the nation. After interning at the Women’s and Children’s Hospital of San Francisco, Thompson returned to Little Rock in 1950 and became the first resident physician in the newly established UAMS Department of Anesthesiology. After residency training, she went into private practice in Little Rock. In 1959, she became chief of the Division of Anesthesiology at the Little Rock Veterans Hospital (now the John L. McClellan Memorial Veterans Hospital) and an assistant professor of anesthesiology at UAMS, where she was later promoted to associate professor. For a time, the Department of Anesthesiology reverted to a division within the Department of Surgery. However, thanks to Thompson’s appointment to professor and chair in 1974, anesthesiology was elevated to department status once again. Thompson became only the second full-time female department head at UAMS. Her contributions included providing anesthesia care at what is now UAMS Medical Center, directing the residency program and teaching medical students. Thompson updated anesthesia equipment in the operating rooms, improved monitoring capability, established a post-anesthesia care unit and opened and directed the Surgical Intensive Care Unit. She also expanded the anesthesia teaching service to Arkansas Children’s Hospital and the VA hospital. Other speakers at the ceremony included W. Brooks Gentry, M.D., professor and chair of the Department of Anesthesiology; and Cynthia A. Wong, M.D., professor, chair and departmental executive officer for the Department of Anesthesia at the University of Iowa Carver College of Medicine. Wong, who got to know Mhyre through her published works, has served as a mentor, colleague and friend. Wong said Mhyre has demonstrated that safety hazards for new mothers extend beyond anesthesia. She praised Mhyre’s advocacy for anesthesiologists to lead patient safety teams of both doctors and nurses to do more than simply “putting the needle in.” She emphasized that part of Mhyre’s clinical and research strengths include her ability to collaborate across the disciplines of anesthesiology and obstetrics to improve the safety of the care delivered to pregnant women. Mhyre was presented with a commemorative medallion by Rahn and Shorey. Mhyre trained at the University of Michigan Health System, where she completed medical school, residency and research fellowships in the Robert Wood Johnson Clinical Scholars Program and the National Institutes of Health BIRCWH Program (Building Interdisciplinary Research Careers in Women’s Health). She joined UAMS in 2013. She has developed a research program focused on maternal patient safety. Specific areas of interest include maternal mortality; severe obstetric morbidity; perioperative and peripartum cardiopulmonary resuscitation; regionalization of peripartum care for women with significant co-existing disease; and systems solutions to improve communication and safety on labor and delivery units. Previously, she served as chair of the Society for Obstetric Anesthesia and Perinatology Patient Safety Committee, chair of the National Partnership for Maternal Safety Subcommittee on Vital Sign Triggers, and the journal liaison for the Society of Obstetric Anesthesia and Perinatology.